Any financial benefits accruing from leaving the EU will be slow in coming and, in many respects, will be expressed in a negative sense: i.e., “had we not left the EU things would be even worse than they are now”. However, it is fair to say that a primary concern for blue collar workers is whether they would be worse off on leaving, and it follows that if we could argue convincingly that we would all be better off, then this would be of powerful assistance to the “leave” campaign. Nevertheless, there are those who argue that there are large groups of people (and especially blue collar workers) who are entirely unmoved by high-flown issues such as sovereignty and questions of “who governs Britain”. Such groups, it is said, will only vote to leave if we can offer them the prospect of immediate financial gain. To do so, though, would be to sell the lie. We are making promises we can’t keep. Furthermore, it exposes us – as we are seeing – to “he says, she says” exchanges with the “remains”, where the arguments are getting bogged down in ever-more arcane detail, and even more strident disputes, as each side seeks to establish their positions. Talk to many people who have actually thought about the subject – and that is an awful lot – and there will be no illusions about the deeply embedded dissatisfaction about the way we are governed, all in the context of a growing “anti politics” mood. And that might end up being the omission which decide this referendum. After we lost the 1975 referendum, we should have started planning for the next, working out very carefully – using the experience gained – what was needed to win. To wait forty years before seeking to define our campaign, when a new referendum had already been announced, was never going to be a winning strategy. Even fifteen years ago, when I first started suggesting that Ukip should be producing an “exit and survival plan” might have been long enough to have got something established. But with a referendum less than four months away, it is probably too late to lodge anything substantial in the public mind. This, of course, presumes that we are going to lose this referendum, and I am not yet prepared to concede defeat, especially with the Leave Alliance launch on Wednesday. We need to fight to the very last so that, even if we don’t win, we put up a credible show. 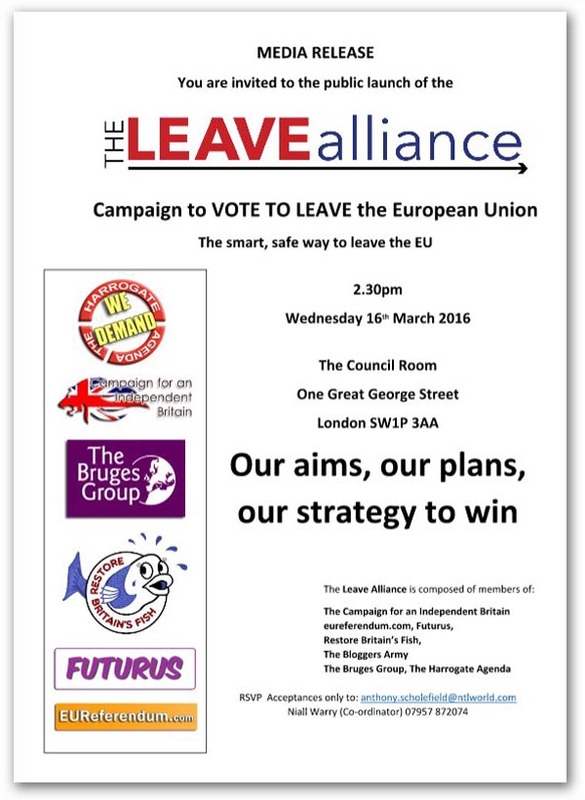 Thus, on Wednesday, at 2.30pm at 1 Great George Street, we see the official start of our campaign. How long that campaign is going to take we do not know. But if the majority do not join us in a “leave” vote on 23 June, it will continue for as long as it takes to get the right result. Previous Previous post: The Tragedy Of EU Membership Is Dawning On Other Victims!